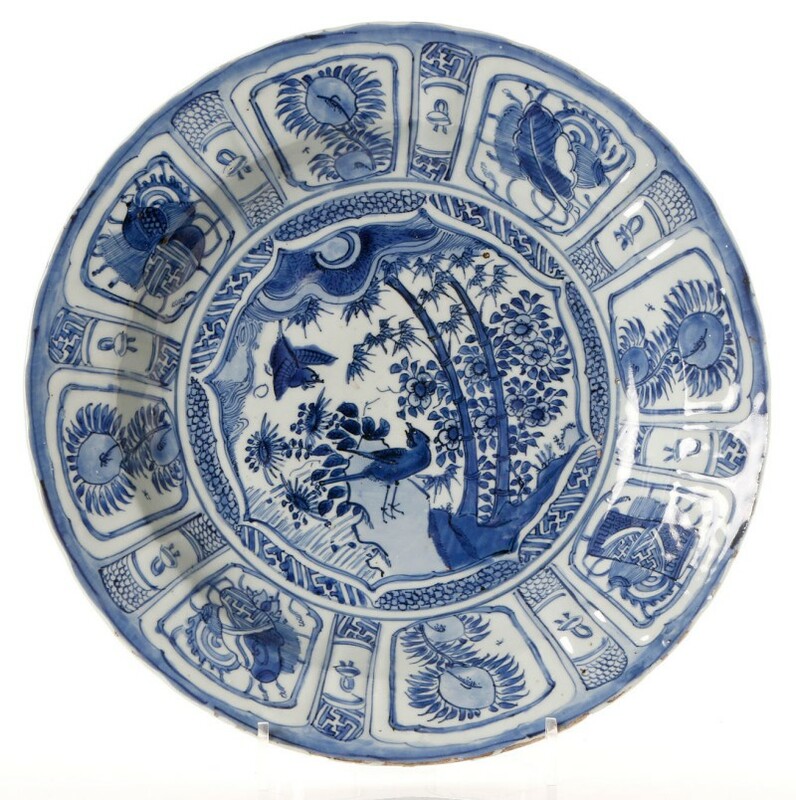 LARGE CHINESE BLUE AND WHITE WANLI (1573-1620) DISH. Blue and white "Kraak" paneled decoration on a thin porcelain body. Diameter 34 c. J E Nilsson Collection. The Portuguese were the first to establish regular trade with China over the sea. The first export porcelain got to be known as Kraak porcelain, probably after the Portuguese Carrack's which were the ships the Portuguese used for the trade. At the end of the 16th century, a most fascinating exchange of ideas started to occur between China and the West. A regular trade with the West had indeed been going on since the time of the Roman Empire when China was known as Seres - the land of Silk. The Portuguese had established the first "modern" trading station in Canton as early as 1556. Very soon western merchants began to order copies of pieces they brought with them or from supplied patterns. Very early commercial middlemen were the Jesuit missionaries that somehow had managed to get connections inland that could be used for trade. From the early 17th century the Dutch presence in the East India trade became more and more noticeable. From their trade entrepot Batavia that they established in Java, they soon came to dominate the trade for the whole century. Typical export porcelain from the 16-hundreds are the so called Kraak wares with paneled decorations, that was actually a style pioneered by the Portuguese. and landscapes with buildings. Diameter 21 cm. Provenance: Sydney L Moss, London, J E Nilsson Collection. In the 18th century western artists started to make up decorative items and whole interiors in a mock Chinese or Japanese style. These Western "Chinese" designs were most fashionable at the time and were called "Chinoiserie". They became an important element of the arts and styles of the mid 18th century. In fact, the rococo style was heavily influenced by western ideas about China and Chinese concepts of form and design. Even western ideas were inspired from Chinese philosophies, something that eventually led to several revolutions, in France, in North America and in Sweden. During the 18th century Chinese export porcelain followed the general trends in western interior decoration fashion, as in table settings and silverware, in textiles, furniture and the wallpapers of the time. In the middle of the 18th century it was rococo that was the rage and famille rose with its thickly applied, opaque enamels was as I see it developed in accordance with the continental fashion at the time. Before this the more garish famille verte was developed from the late Ming Daoist inspired wucai, to coincide with the European baroque period up until 1720s. Rococo and Famille Rose spans the 1730s to 1760s. From 1760s and onwards the trends branches out into several styles. In general, the decorations becomes more influenced by European decorations. You will find decorations bases on Chinese and western book illustrations and prints, western so called "German flowers" inspired from Meissen and maybe other European porcelain factories occurs. At the end of the 18th century the rococo fizzles out and a classical influence from Rome becomes noticeable with decorations in mostly monochrome enamels, such as black, sepia, blue and gold, while showing larger white areas of white porcelain surface than before. Bowl in famille noire decoration, Kangxi period. Musée Guimet in Paris. During the early and mid 18th Century Chinese polychrome porcelain decorations developed into groups we now describe as "families" such as Famille Verte, Famille Noire, Famille Jaune and Famille Rose. Actually, if you visit the Musée Guimet in Paris, you will see immediately how Chinese porcelain looked to Albert Jacquemart (1808-1875) and why he in his book Histoire de la céramique choose to sort Chinese export porcelain up in families. Today when items of this kind have become rare, I feel we are left sorting up the crumbs where he and his likes were still handling the loafs however, to some extent his families are still a workable tool, however blunt. Other decorations also got individual names among collectors, such as Chinese Imari, Grisaille, Jesuit porcelain or Sepia and Encre de Chine, Rouge de Fer as well as Blue and white. Even within these groups individual decorations also got names, such as the Willow Pattern, FitzHugh, Plum Blossom and 'Chucko in the House' etc. A large number of other styles and patterns were also recognized by name by collectors and scholars trying to bring order to this field. In reality all these different groups were never perfectly separated and most incorporated elements from others, creating endless opportunities then as well as today, for heated discussions among collectors about what is what. Help would come from an unexpected direction since by the early to mid 19th century Chinese porcelain had by and large fallen out of fashion, and the previously so important "families" was replaced with a more limited number of polychrome and blue and white standard patterns, recognized as Mandarin, Rose Medallion, Nanking and Canton, still however never clearly defined. 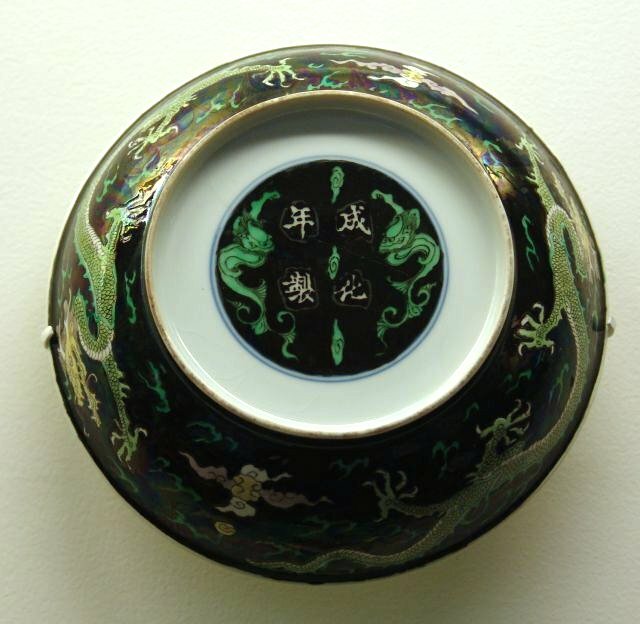 During the Kangxi period in the early part of the 18th Century, the late Ming wucai or "five color" decoration developed into a new "family" called Famille Verte, or the "green family." These were based primarily on different shades of green in combinations with red, blue and yellow. Pieces from this period and with the decoration executed in Famille Verte enamels sometimes occur with the decoration set against a black or yellow background These are known as Famille Noire and Famille Jaune, respectively. Rare as they are, genuine examples are even more rare. A really neat fake I recently studied had got its entire underglaze blue decoration with glaze and all ground away and replaced with a Famille Verte decoration against a yellow ground. Probably around the turn of the century when the prices for these rare and impressive pieces was incredibly high. Since the porcelain body and mark was genuine Kangxi, this old fraud was very hard to detect. Simultaneously with the replacement in Europe of the Baroque style by the Rococo, the Famille Rose appeared in the Chinese export porcelain. Significant for this style is a new emphasis on flowers, influenced by the by now established Qing dynasty, a different color scheme based on enamels mixed with white to give a softer impression, and the presence of a new rose enamel based on gold. In reality the different "families" were not that perfectly separated. Mixtures of styles occur. 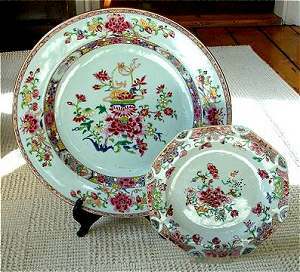 The plate and charger to the left are good example of early "Famille Rose", as its best and most typical look. They have both iron red flowers under the rim, typical for the first decades of the 18th century. 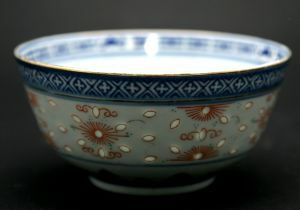 Two branches in red or underglaze blue under the rim indicates a date from the early decades of the 18th century and occurs up until the 1740s. During the remaining 18th century the flowers develops towards a more western look and becomes smaller. Tea caddy and a punch bowl. decades earlier than the bowl, copying a metal shape. During the first half of the 18th century a recognizable group of decorations that got to be called 'Chinese Imari', after the Japanese Arita district porcelain export harbor - Imari. During the turmoil of the "transitional" period by the end of the Ming dynasty to the beginning of the Qing, the Chinese had lost most of the porcelain trade to the Japanese, who had developed a simplified wucai (Chinese five-color) decoration - to this day called Japanese Imari. When the political conditions got stabilized in China the Chinese hurriedly copied this Japanese style - hence the name Chinese Imari. From the excavation of the Dutch East Indiaman "Geldermalsen" we know that identical designs executed in underglaze blue and white, Famille Rose and Imari occurred at the same time. 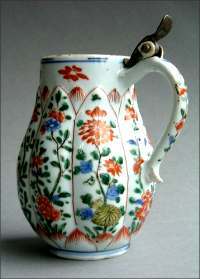 No doubt every western country could be said to have contributed to the development of the Chinese Export Porcelain, so also the US which contribution came late, though, and which most important part must be said to have been the providing of a ready market for the late 18th century standard patterns. Sepia decorated porcelain was something of a favourite among special orders, often based on western book illustrations or engravings, printed in black and white. A special family of porcelain is pieces decorated in "black and white". They appeared by the 1740s as "Jesuit china" and seems to have stayed in vogue until the 1780s. This group is also called encre de chine or en grisaille. The sources for the decorations were during it early part black and white engravings or book illustrations with romantic, mythological or religious themes. Pieces with this kind of decoration are rare and most decorations are known under the names of their decoration. This plate illustrated here is known under its name of "The Adoration of the Shepherds". The original in this specific case is an engraving by the Amsterdam artist Jan Luyken (1649-1712) which were used in several Dutch Bible editions. This decoration can have been taken from a Bible illustration, brought by some of the Jesuit missionaries visiting China or having been ordered by some Dutch merchants working from Batavia (present day's Jakarta). The carefully designed border appears to rely on a European design print of the 1730s, possibly by Francois Boucher (1703-70). 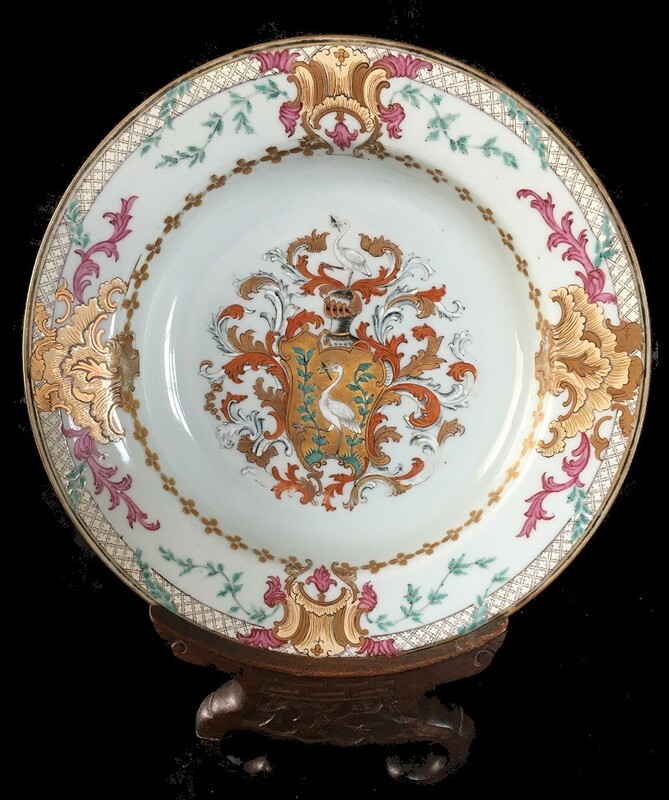 Swedish market Chinese Export Armorial Porcelain for the Family of Grill, ca. 1735-50. Courtesy M Karlsson Coll. 2019. 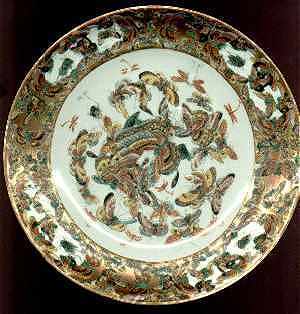 Porcelain with special designs and special coat of arms actually started to occur already during the late Ming period, ordered already by the Portuguese. During the Qing dynasty, Kangxi period (1662-1722) more services are known, however it was not until the British entered the trade in all sincerity, that the commissioning of armorial porcelain with family coat of arms became substantial with something like 3,000 known armorial services as compare to the more modest around 300 known Swedish armorial services. During the 18th century an important design source to the Chinese were the special designs made for wealthy western families. It is more often the rule, rather than the exception that the border designs from the special designs porcelain simultaneously appears on the bulk wares made for the trade. But, thanks to this general practice most Chinese Export porcelain of the 18th century could be dated with a high degree of accuracy within a few years of it date of production by comparison with the border designs of dated armorial porcelain. Over the century the decorations develops from a very cluttered bombastic, covering it all decoration filling up the central panel, to much more sophisticated decoration where the coat of arms eventually shrinks and moves up onto the rim. By the end of the 18th century and into the 19th century, it became the common practice to only used small sophisticated initials, or to have the family coat-of-arms integrated into a standard pattern instead. The first standard pattern that was developed onto Chinese export porcelain by its popularity and success is a nowadays loosely held together group called the Willow Pattern. Printed 'Willow Pattern' on English Spode porcelain. It seems likely that the patterns as such were designed in England based on earlier Chinese prints or paintings of river scenes. The two main variations of this pattern differs mainly is their borders and are called Spode and Mosquito pattern respectively. The illustration to the left is of the actual printed English Spode pattern. The Spode factory in England was established in 1770. Its "willow" border is built up by irregular geometric designs clearly distinguishing it from the "mosquito" border, also called the "brocade" border, the latter having more rounded shapes, being as I see it more artistic and containing more of recognizable Chinese symbols. 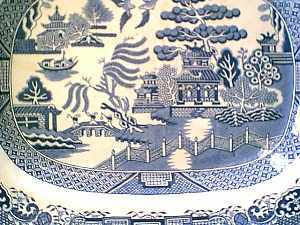 Other sources have it that the Willow pattern plainly was created by Thomas Turner at Caughley Pottery Works in Shropshire about 1780. Long ago, in the days when China was ruled by emperors, a Chinese mandarin, Tso Ling, lived in the magnificent pagoda under the branches of the apple tree on the right of the bridge, over which droops the famous willow tree, and in front of which is seen the graceful lines of the fence. Tso Ling was the father of a beautiful girl, Kwang-se, who was the promised bride of an old but wealthy merchant. The girl, however, fell in love with Chang, her father's clerk. The lovers eloped across the sea to the cottage on the island. The mandarin pursued and caught the lovers and was about to have them killed when the gods transformed them into a pair of turtle doves. These are seen gazing into each other's eyes at the top of the design. A lengthy and old Staffordshire poem of the pattern concludes with the verse: "In the oft quoted plate two birds are perceived, High in the heaven above: These are the spirits of Chang and Kwang-se, A twin pair of ever in love". To me it seems very likely that this story is based on the pattern rather then the other way around. As a matter of fact nine out of ten Qing dynasty stories contains an evil mandarin and a beautiful girl somehow, as is pointed out in "The Dream of Red Mansion". If a Chinese literary source is sought it is worth noticing that the pattern actually much better would fit "The Romance of the Western Chamber", a quite frivolous little piece, quite popular, and quite forbidden in China at the end of the 18th century. 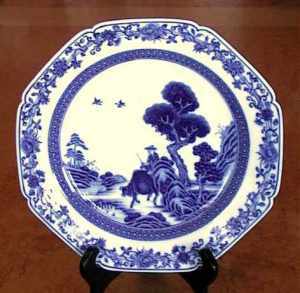 A close relative to the Willow pattern is the Nanking group of pieces, characterized by its higher quality, a specific square cell diaper border outlined with a spearhead border and with a more general landscape setting with houses and water in a river landscape, dating also from the 1780s. 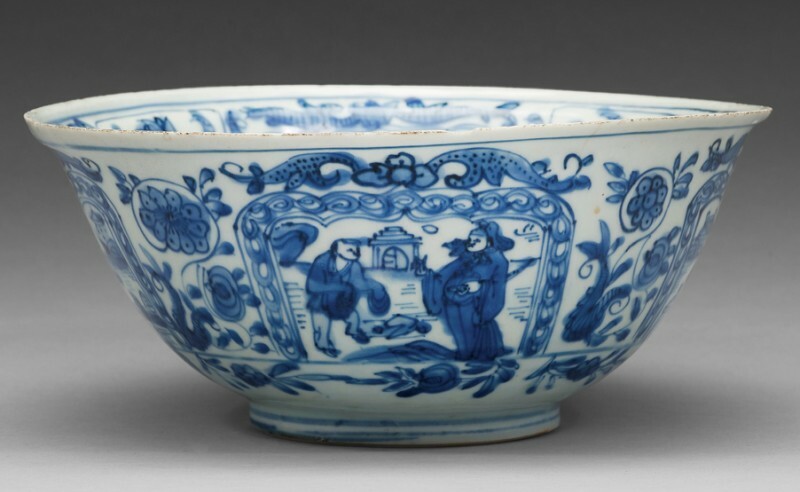 The quality of the porcelain made for export to the West is really often the same or better than what was made for the Chinese regular market, sometimes competing in quality with Imperial wares. The often-repeated "truth", that the export porcelain as a rule was of less quality because of some kind of contempt for the westerners, is a myth. However, the Chinese were of course always prepared to make porcelain of as low quality as the customer wanted. 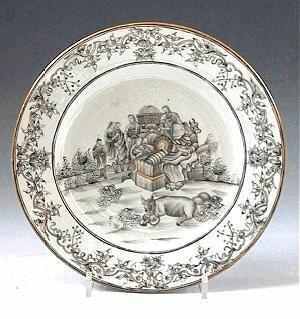 From the 1760s and onwards a special kind of superior "Imperial quality Export Porcelain" came to be, possible in competition with the European porcelain factories that by now started to be able to transfer print engraved decoration at great ease. This made the Chinese trying to outdo this, but by hand. These extreme efforts resulted in a group of very rare high quality porcelain on a white and thin porcelain. In its better exponents the FitzHugh pattern shows of some of this skill. on ultra white high kaolin porcelain base. Around the 1780s the next patterns to appear were the mostly monochrome FitzHugh pattern. It was only made for a few decades up until the 1820 and exclusively for export. The spectacular quality is similar to the best of the above mentioned Nanking and late Willow patterns. The FitzHugh pattern bears a close resemblance to the composition of the design on contemporary Chinese textiles, which might have served as an inspiration to the pattern maker. It consists of four groups of flowers or plants spaced evenly around a central panel, which in rare pieces are replaced with a coat-of-arm, initials, or a scenic view. 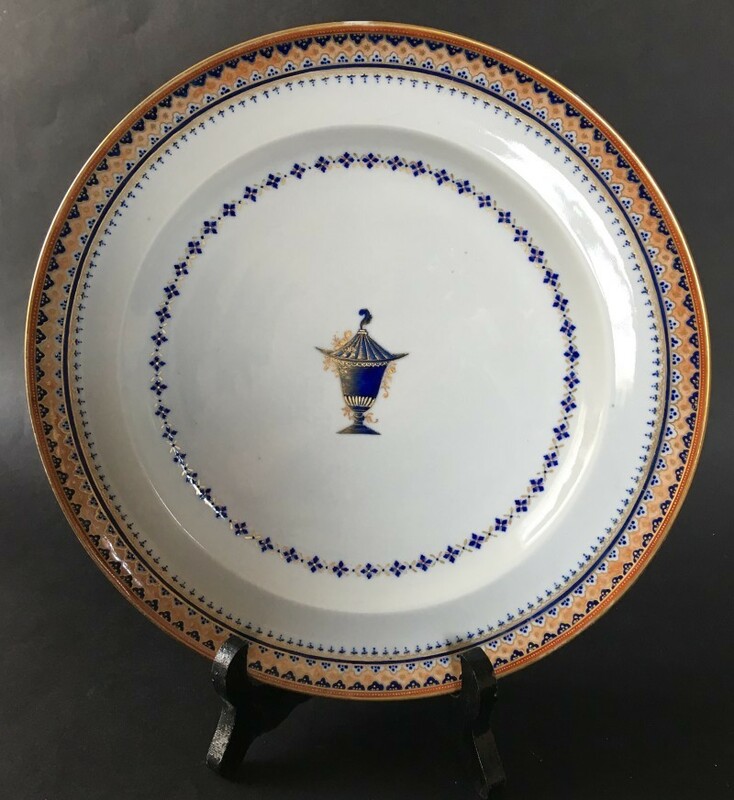 The FitzHugh pattern is usually found as an underglaze blue monochrome decoration but is also known in gold, green, blue, yellow, black, orange and sepia enamels as well as in combinations. FitzHugh pattern have been and are reproduced. Collectors should get to know the typical shapes. Because FitzHugh was popular in the late 18th and early 19th century the shapes of pieces should reflect the style of the period - larger dinner plates with a shallow curved rim, drum shaped teapots, helmet or hog snout pitchers, twisted stalk handles with elaborate leaf terminals. There should be no marks. The serving pieces are quite substantial and heavily potted, often with a noticeable "orange peel" surface. There should be noticeable wear - most prevalent on the fronts of plates where they were stacked together and on platters and dishes where food was scooped with spoons and meat was cut with steel bladed knives. If there is gilt penciling over the enamel it should show some wear somewhere! Look for the typical small black spots and pin holes on the surface typical of Chinese export porcelain of the 18th and early 19th century, along with a slight grayish color to the paste itself. There are some obvious fakes around. Some orange and green enameled plates with very heavy and poorly painted decoration on very white sparkling porcelain. Sometimes these are bound in pewter rims. Be wary of green FitzHugh on which the design is done with decals and filled in with a very watery green enamel. Be especially wary of any eagle decorated green or orange FitzHugh - its coming out of China as we speak. 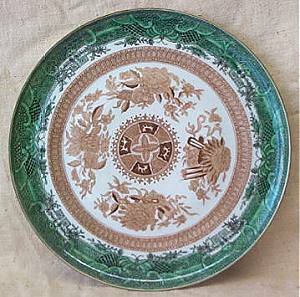 Chinese export porcelain plate with decoration in neo-classical style becoming common at the end of the 18th century, end of Qianlong 1826-1795 to Jiaqing 1796-1820. The decoration is now so adapted to the European export market that it could even be difficult to recognize it as Chinese. I believe by and large inspired by and trying to match the new style developed by Wedgwood, at the end of the 18th century very strict decoration characterized by small decorative embellishments or medallions applied onto large areas of white and mostly undecorated white porcelain surfaces. The direct influence was most probably Josiah Wedgwoods jasperware while the long term reason was a change in fashion inspired by the rediscovery of ancient Rome and Greece. 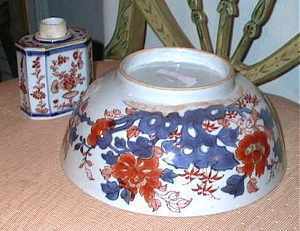 Contemporary with the various blue and white "Canton" decoration as above came a series of polychrome enameled decoration such as the Mandarin and the various "Rose" patterns such as Rose Medallion, Rose Mandarin, Rose Canton and the Cabbage and the Bird and Butterfly patterns. Most of these were made between the years 1840 and 1880 exclusively for export. Around 1860-80 simplified variations of these decoration appeared against a Celadon ground. Some variations and especially the "Rose Medallion" and "Rose Mandarin" are still being produced. Because of a world wide depression in the mid 1880s much of the world trade seems to have come to a standstill. Rose Medallion is the pattern with the widest variations in forms, pattern, and quality. Four alternating panels around a central gold circle ("medallion") enclosing a bird and a tree peony characterize it. Within the four panels are birds, flowers, butterflies, and people in a house. Separating the panels are scrollwork vines, and flying "Fu" bats, a symbol for good luck and happiness. Rose Mandarin is a variation on Rose Medallion, which shows only people in the panels; and Rose Canton, which shows only birds, flowers, and butterflies, with no people. within the Rose medallion family. Higher quality Rose Medallion will exhibit the use of gold to highlight details and finer, more realistic details on the birds, vines and butterflies. In comparing different pieces, the pieces of better quality have more exquisite details inside the medallions. The Bird and Butterfly pattern was produced during the mid-19th century and is so rare it could hardly merit to be labeled a standard pattern, but is anyway easy to distinguish, as it has butterflies throughout the pattern. The shapes on all these are mostly the same as in Canton. Other "patterns" you may find are Cabbage, Green Dragon, Sacred Carp, Sacred Flower and 100 Antiques. Around the mid 19th century the Willow pattern seems to have developed into a simplified pattern generally known in the US as Canton. There are no reason really to separate this family from the "Willow" patters other then its date and quality. 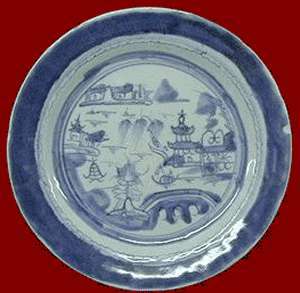 Illustrated here is a dinner plate decorated in underglaze blue with the traditional exotic houses, mountains, sailboats and a bridge set against a white porcelain ground. The central panel is surrounded by a "rain and cloud" border. The use of this earlier pattern border and the thick "orange peel" glaze indicates a date around 1850 and is a "mid period" piece while the earlier are of a better quality - since they are developing towards this from late "Willow" while pieced later then this keeps this simplified design but in a much more "tidy" version. 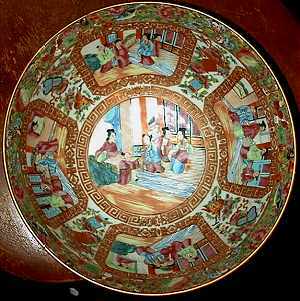 At the end of the 19th century the increasing wealth of the Straits Chinese population at the Malaccan peninsula created a special market for Chinese export porcelain, catering to the local fashion sense of the Peranakan population. It was Chinese immigrants who had married into the local population and settled down to create a new Chinese culture outside of China. The patterns appears to by and large have been inspired from local textile fashion and made to fit into the increasingly wealthy homes and family life's created by this society. 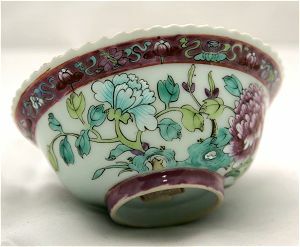 The quality of the items are in general very high and in the cases new and special shapes was ordered, which was more often than not the case, they were no doubt made at the newly founded Jiangxi Porcelain company (Jiangxi Ciye Gongsi) established in Jingdezhen in 1910 and before that, most likely at similar quality establishment of the group that was subcontracted by the Imperial factory at the end of the Qing dynasty. pattern, c. 1920. Notice the frilled rim. and enamels, late 20th century. No account of the various standard patterns developed to cater for the western love of the oriental would be complete without the last stroke of the Chinese genius - the Rice Grain Pattern. By the end of the Ming dynasty, a kind of pieces appeared that was called "Linglung" or "Devils work". It was porcelain pieces with its walls pierced in intricate patterns. These were very expensive and are known to have been fitted in gold and silver when in Europe. By the mid 19th century the "Linglung" design was revived in an inventive new way. By filling the pierced holes with translucent glaze one arrived at an interesting compromise combining as it did both the mysteries of Asia - "how they possibly could have fitted rice grains into the porcelain" - and a somewhat more useful bowl that better could stand the perils of trade and transportation.